One of my favorite books is the 1897 Sears, Roebuck & Co. Catalogue reprinted from the original by Chelsea House Publishers in 1968. 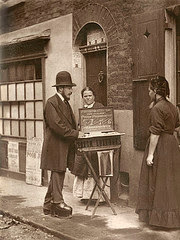 What a delightful snapshot of life in the late nineteenth century! In beginning this new series of blogs, I paged through the catalogue until I came to the section on drugs, curious to see what medicines were available by mail order. "This is Dr. Pasteur's Microbe Killer, which if taken once or twice a day, will prevent La Grippe, Catarrh, Consumption, Malaria, Blood Poison, Rheumatish and all disorders of the blood. It acts as an antiseptic, killing the germs which are the cause of these diseases. This preparation of Dr. Pasteur's will eradicate any form of disease and purify the whole system. 1/2 gallon bottles, each, 97c; per doz $11.50"
An internet search failed to reveal any additional information about this particular product. However, I did find a similar product called Radam's Microbe Killer touted as based on Pasteur's formulation. The bottle showed a clever cartoon in which a man with a bat threatens an animated skeleton. A contemporary analysis of the contents of Radam's Microbe Killer suggested it was composed of a gallon of well water, an ounce of red wine, a dram of impure muriatic (hydocloric) acid and four drams of impure oil of vitriol (sulfuric acid). Yuck! 1897 Sears Roebuck Catalogue, Chelsea House Publishers, 1968, pg. 27. Author's Notes: Caution - hot!